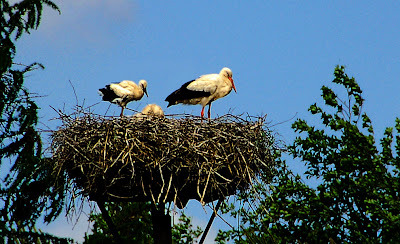 White Storks used to be a common sight in the little village in Germany where I grew up. Their return to their old nests each year heralded the true onset of spring - and a new beginning since for us kids any sighting meant a new life was about to be born somewhere in the neighborhood. 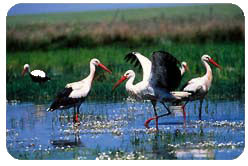 Gradually over the years sightings of storks became less and less common as the moors and wetlands were being drained to make room for agriculture. There's only one pair now, and to be sure they stayed, the villager erected a stable platform for their nest. On a trip to Spain though I discovered where our storks had stopped and stayed on their return from their wintering grounds in North Africa. Almost every high building or church spire in the city of Caceres on the river Tajo had one or more of their massive nests and in the surroundings were plenty of ponds and wetlands to supply their favorite prey, frogs. A new beginning was what I was looking for too. I am apologizing that for the past several months I have neglected visiting and leaving comments on my favorite birding blogs. I have been dealing with a critical health issue, and so, in this post, I am not going to write about birds, but about how a Google search saved my life. I had become aware of some problems with my memory, such as blocking on names and words, and had started feeling insecure on walks. I was falling frequently without clear cause, falling on trails, on side walks, into a pond, and in an airport.There was no rhyme or reason to these falls, no stumbling or tripping that I was aware of, and fortunately no serious injuries other than bruises. My walking had turned into a choppy gait when tired and hurrying. My husband remarked on it and demonstrated to me what looked like a Parkinsonian gait. But I knew it wasn't Parkinson's, since there was no rigidity or joint stiffness. It was also puzzling that these problems appeared only intermittently, days or weeks at a time. I saw a neurologist who however couldn't find anything abnormal and referred me for baseline neuropsychological testing. But it turned out to be more than a baseline. The tests looked like child's play with colorful disks, pictures, cards, photos...but the report, after several hours of testing, and the test results being abstracted into numbers and the scores compared to standard data, showed I was no longer as smart as I once was. The neuropsychologist reassured me however that the test results did not point to AD. I had done extensive reading on neurological diseases such as Parkinson's, AD and multiple sclerosis and had found none that matched what I was experiencing. So I finally entered my symptoms into Google search and I think putting "frequent falls" first was the tip-off in that a new disease popped up: Adult Onset Hydrocephalus and specifically Normal Pressure Hydrocephalus (NPH). Everything fit: my many falls, my instability when traversing rough terrain, my memory problems and lastly, which I actually hadn't considered a problem yet, urinary urgency (or the sprint to the BR when observing my dogs relieving themselves before bed time). The tragedy is that the disease, although rare, is treatable but most of the time is not diagnosed. Many patients, bed-ridden or wheelchair-bound in nursing homes because of inability to walk, dementia and bladder incontinence, may actually be suffering from NPH. Dr. Harold O Conn, a former Yale hepatologist (liver specialist), eloquently recounts his own many-years-long journey as a misdiagnosed Parkinson's patient until a new neurologist came up with the correct diagnosis. He was cured with the placement of a shunt to drain off excess fluid from his brain, and since then has been devoting his remaining years to NPH research. 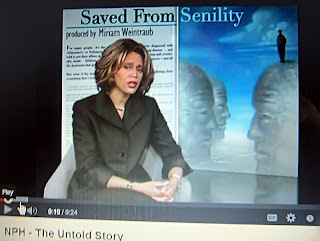 The CBS program 60 Minutes devoted a segment to this disease which then served as a wake-up call to many patients, their families and to physicians. Along with the triad of symptoms - problems with gait, memory, and bladder control - diagnosis depends on showing enlarged fluid-filled lateral ventricles on CT scan or MRI. An MRI of my brain was initially read as normal. However I also happened to have had an MRI in 2003 for an unrelated problem, and a comparison between the two showed that in the current one the ventricles were significantly larger. I was so lucky to have come up with a diagnosis so early in the course of this disease, which so infrequent, is often missed. The next steps went pretty fast. I was referred to neurosurgery, had some more testing, and a couple of weeks later was admitted for placement of a shunt which drains the excess fluid from my brain through a thin tube under my skin to my abdominal cavity where it is being reabsorbed into the blood stream. The symptoms related to my walking resolved within a couple of days; my memory may take a little longer. I am sure of one thing though: a Google search averted a catastrophe and gave me my normal life back! I am looking forward to go birding again this spring, venture off trail without fear of falling. At 6 AM a couple of mornings ago I heard a Woodcock's twittering wing beats overhead and another one peenting from the wetland across the road. Shortly after, as the sky lightened, a Robin started singing. All day a Tufted Titmouse has been calling loudly advertising his availability as a mate. Last night we heard the first spring peepers in the swamp next to our house. The snow has melted and spring is here! We are so very glad you are OK!! Wishing you lots of Happy Birding! Thank you, Lillian and Don. Hope this will help spread the news about an eminently treatable but often missed diagnosis. Wow! What a story. Hilke, I'm honored that you would share this experience here at BirdingIsFun.com. I often hear interviews where doctors complain about patients self-diagnosing using the internet...and I image that it is a very real problem. Yet, you a physician yourself used the internet to self-diagnose and it made all the difference in the world. Amazing! Here's to you Hilke...and to many many more years of fulfilling birding! What a moving story. So glad for your observations and research. I am sure every time NPH is accurately diagnosed and treated, the medical community becomes more familiar with its symptoms and others will be helped. I am happy for your discovery and treatment. Enjoy the awakening of spring in a special way this year! As a retired (and therefore dangerous) physician myself, I tried to interpret your symptoms and come up with a diagnosis before getting to the latter part of your narrative. I did no better than the others, and also would not have thought of Googling for it. So fortunate that you had the earlier image for comparison, but in any event you (and of course the internet) get all the credit for pointing to the correct problem and persisting in your conviction. I extend all good wishes for your complete and uneventful recovery! (I'll have to talk about our missing storks later on). Nice Stork shots! So glad you're getting your health issue all straightened out. All the best to you, Hilke, for a strong recovery & splendid bird filled spring! Amazing Hilke. Thank you for sharing your story and your courage. Thank you all for your good wishes! Ken, having that earlier MRI made all the difference. I have almost come to be a believer in providence. Wow, Hilke! It is amazing to me that even as a physician you had to do a google search to get a diagnosis! Thank God you did discover the cause and were able to get such prompt treatment! I do so hope all continues to go well, and that your memory improves more day by day. Thanks for sharing such a personal and important story with us. I know this info will help someone else along the way! Welcome back to birding! May it always be Fun for you! Thank you, Kathie. The internet is pretty amazing. Bing would have probably given similar results. I chose Google in the title because I thought it would make people want to read and learn from my story. Wow from me too, Hilke. What an amazing story. Dr Google should not be underestimated, but always good to discuss the findings with a physician of course. Glad to have you back! I had to laugh, Gunnar. I am picturing Dr. Google in an underground cave sorting through websites and passing them up to daylight. He did a good job with me! Hilke, I am 90 percent certain that my Mom also suffers from NPH, but my search was done too late to help her. In addition to the Parkinson's-like gait, she would suddenly be unable to move her leg at all, causing falls and psychic traumas. When those incidents occurred, she could only say that her foot or leg became suddenly 'frozen' or simply 'stopped working'. She was hit by a car at 16, and extreme head trauma (even early in life)is another potential contributing factor in Normal Pressure Hydrocephalus. I'm very glad to hear that you will not suffer the slow decline of undiagnosed NPH. Access to the vast resources of data on the internet is only one part of saving your life, however. You must have been a firm and persistent advocate for yourself while navigating the medical system, Hilke, because otherwise your knowledge would get you nowhere. Doctors don't usually listen to patients who self diagnose, and they definitely don't want to hear about Google searches. It takes a strong person to overcome this resistance, but in today's world, it is absolutely required. Even the best doctors don't have time to keep up with every new medical breakthrough, and many do not even try. I asked one doctor when she last read a medical journal, and she said she hadn't read anything about anything since she graduated medical school . . .thirty years ago! I now know that every one of us had better become more involved in our own health care, because no one else will do it for us. You don't have to be a physician to be an effective advocate, either (although it probably helps a bit!). I guess the bottom line is that I don't agree that Google saved your life, Hilke. The truth is that YOU saved your life, and you deserve a whole lot of credit for doing it so quickly and so well. You have always been an inspiration to me as a blogger, a birder, and a photographer. Now you have inspired me yet again, and I truly hope your story inspires others, as well. Susan, your comment gave me goosebumps. Fortunately my primary care physician, my neurologist and neurosurgeon paid close attention and took me seriously. NPH is difficult to diagnosis, but when it's suspected the default solution is to do shunt surgery since missing it condemns the patient to a life not worth living. The disease is easily missed even by neurologists. In a chapter on gait disturbance on a neuro website (http://www.aan.com/go/education/curricula/internal/chapter8) NPH is not even mentioned in the differential. Your mother's sudden inability to move her leg sounds like a symptom called "magnetic gait". It's never too late to treat NPH. Look at the 60 Minutes video clip. Did your mother have a CT scan or MRI? If not she should! Oh my goodness, you have been through quite a lot of the last several months! So glad you were able to come up with a diagnosis and are now on the road to recovery. It was courageous of you to share this very personal story, Hilke. 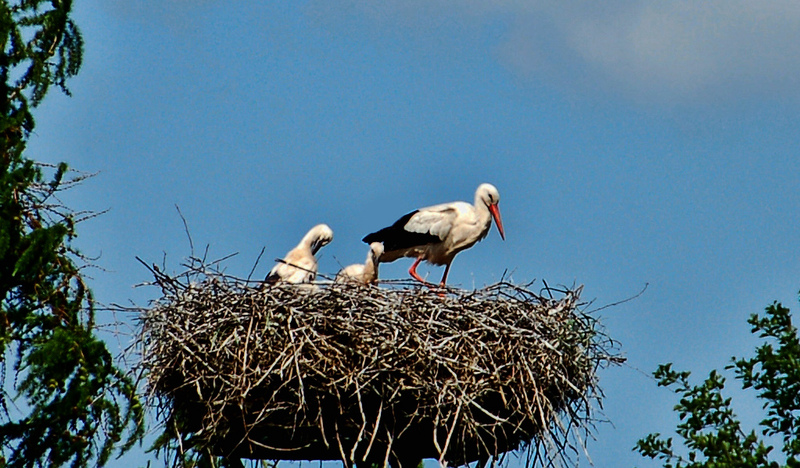 Fantastic stork images! Thank you, Julie! Sharing my story: I feel I am kind of on a mission to raise awareness of this potentially devastating condition which is so often misdiagnosed. I was really lucky in having had that earlier MRI. What a nice post. My big bro Mj Zinnat said: "To use what do you want to know and find out what do you don't know. It's Spring, or is it? Marbled Godwits are on the move in the LCRV! Where is the birding mentor? Being Birds: Spring Fun Edition?